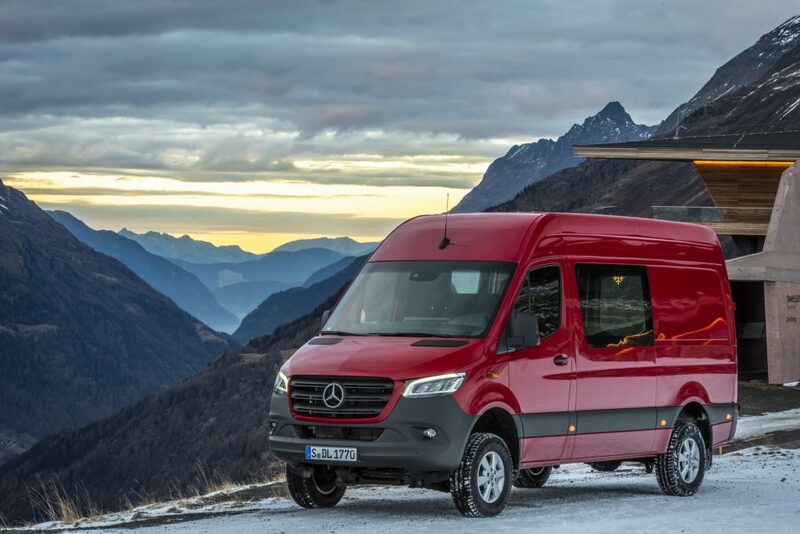 Mercedes-Benz will be rolling out the all-new 2019 Sprinter 4×4 into UK dealerships next year, 12 months after the launch of the front and rear-wheel drive versions. 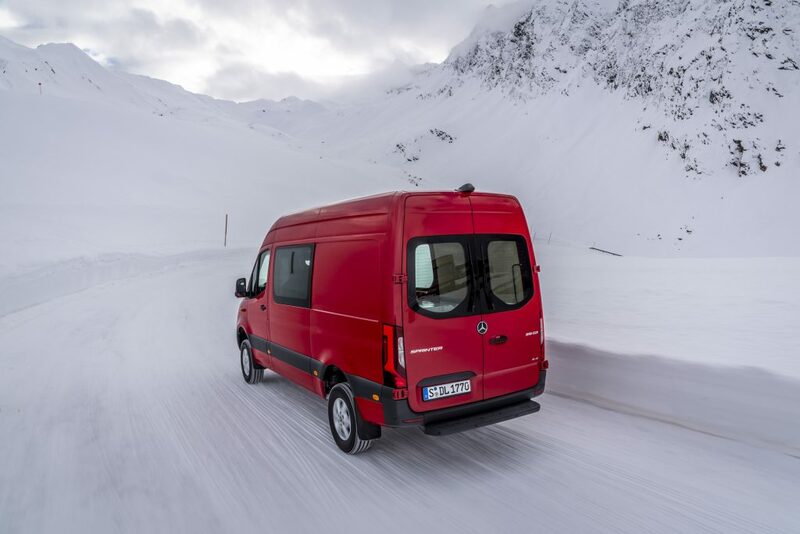 The Mercedes-Benz Sprinter 4×4 2019 is far more capable and comfortable, and we put it to the test on the snow-covered caps of the Austrian Alps. The Mercedes-Benz Sprinter is now almost 25 years old, and 4×4 versions have been available under special order since the model was introduced in 1995. Four-wheel drive versions were especially popular with the second-generation, launched in 2006, when a new 4-wheel drive system and new technology greatly increased its off-road capabilities and they featured on the UK list price from 2011. 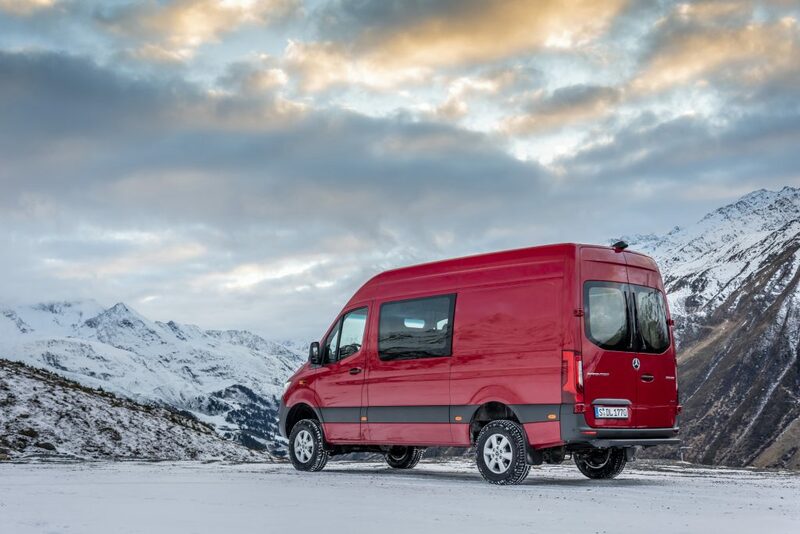 Presented in 2018, the third-generation Sprinter is now the most advanced panel van to be produced to date with features like the Mercedes PRO Connect and Mercedes-Benz User Experience, but it was originally only available in front and rear-wheel drive. Less than a year after launch, Mercedes confirmed a 4×4 version was on its way. 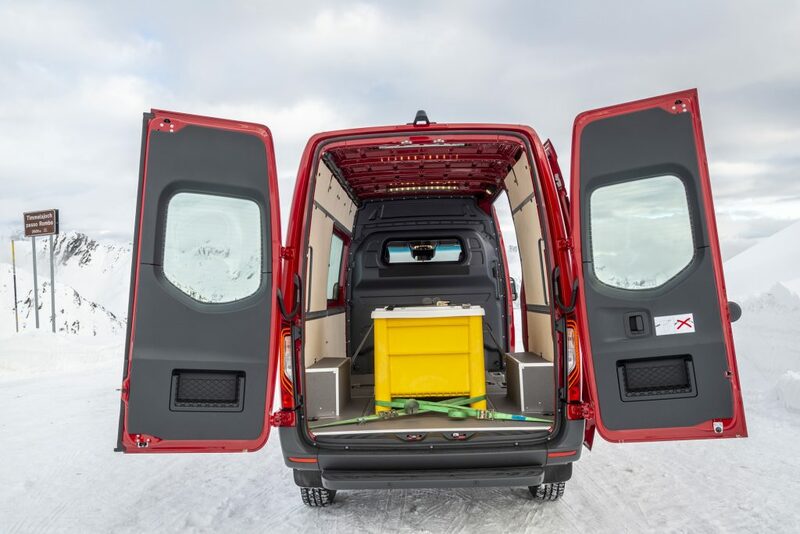 The 2019 Sprinter 4×4 features the upgraded chassis, interior and technology of the new, third generation model, but it will inherit the same 4×4 technology as its predecessor. Let’s start with the basics. There are two engine options on the new Mercedes-Benz Sprinter 4×4; the 2.1-litre OM651 unit producing 143hp and 300Nm or the 3.0-litre V6 OM642 engine (which also features in the X-Class X350D) generating 188hp and 440Nm. The smaller 2.1-litre engines are hooked to a 6-speed manual transmission, while the large 3.0-litre V6 models come with the seamless 7G Tronic Plus automatic as standard. Four-wheel drive is engaged by the push of the button when stationary or at low speeds (up to 6mph), which prompts an electric motor to engage a spur-gear pair on the transfer case (35:65 front to rear) and reduce the gear ratio by 42%. The system onboard the Sprinter 4×4 works differently to its competitors in that its not a rigid through drive; instead, power is transmitted variably depending on the conditions, although the only drawback is a very slight humming sound when engaged. Instead of using mechanical differential locks like other models, the Sprinter 4×4 uses 4ETS Electronic Traction System which automatically applies the brakes intermittently to the spinning wheels while increasing the drive torque to wheels with traction at the same time. It’s incredibly effective and cut in before we could tell we’d lost traction, although Mercedes do offer differential locks as an option if needed. In addition to this adaptive ESP, which remains fully functional in all-wheel drive mode, there are a number of other technological aids like the Down Speed Regulation, which detects if you’re travelling too fast for the conditions, and automatic brake intervention. Inside its pretty much business as usual for the Sprinter. With the introduction of the latest generation Sprinter, Mercedes-Benz has raised the bar in terms of comfort, stylish and refinement with a well-presented and modern interior with a wide range of standard features. One such feature is the MBUX (Mercedes-Benz User Experience), which includes a high resolution 7-inch touchscreen with intuitive touch controls, voice controls, a geocoded map system called ‘What3Words’ and a permanent internet connection which enables Mercedes PRO services. Steering-wheel mounted controls, Bluetooth, Apple CarPlay, Android Auto, a WIFI hotspot and a DAB radio are also all standard. UK-specs have yet to be announced, but Mercedes-Benz will not be offering every variant. However, we can tell you that compared with other 4-wheel drive systems, the Oberaigner product is relatively lightweight and compact. This means there’s very little intrusion into the payload (just 135kg for the 3.0t and 3.5t derivatives and 105kg for the 4.6 and 5.0-tonners) and also the chassis doesn’t need to be lifted quite so high (just 120mm at the front and 80mm at the rear). Payloads are therefore expected to be as much as 1,150kg on 3.5t versions. Prices have yet to be announced but on the previous Sprinter, 4×4 models were a £5,800 plus VAT premium. Given that the technology has remained the same, it’s expected the premium will only increase slightly (see current Sprinter pricing). We imagine the medium wheelbase, low roof model in 314CDi form (the lowest spec 4×4 Sprinter) will cost around £37,500 plus VAT. 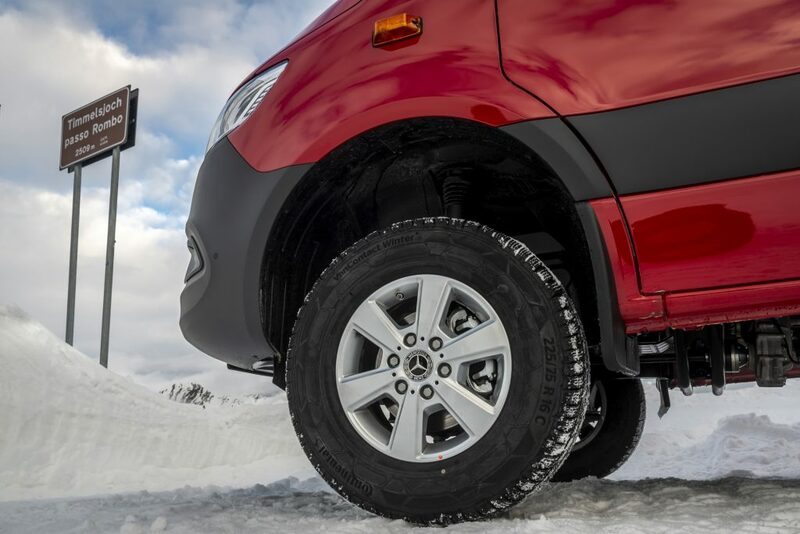 Read the Iveco Daily 4×4 review.